Nestling in the heart of an ancient highland estate on the edge of the Cairngorm National Park, the surrounding hills rising to 2500 feet, this 5-star rated 18th century cottage with private hot tub is in an utterly secluded position with stunning views towards the Grampians, yet it is only 90 minutes from Edinburgh and 35 minutes from fantastic cashmere, kilt and gourmet food shopping. Since half of our clients either become engaged here or come for their honeymoon, we can claim with justice that this is a very romantic place, well away from the stresses of modern life! Clover Cottage has been beautifully restored with a wood burning stove, wood panelling, exposed beams, extra-long bed with electric blanket, along with every modern amenity, bathrobes and fluffy towels. You can walk for miles from the doorstep, through a profusion of wild flowers (part of the glen is a wildflower reserve), or along woodland paths to the Fairy Glen, and the high tops. You can arrange to fish on the estate's river and lochs, hire mountain bikes, or just relax in the hot tub, then have a massage while our chef prepares a romantic dinner from local organic produce. We can also do your shopping or laundry, collect you from the airport, book riding or golf tee times or, in winter, measure you for skis, bring them directly to you and arrange lessons or a guide at Glenshee, 35 minutes away. There are wonderful views from the bed itself up the glen to the Queen's Estate at Balmoral. 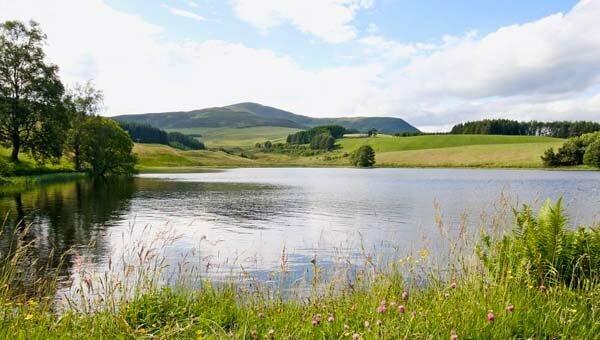 Lie there listening to your own highland burn running through the garden, or sit in the boat watching the Highland ponies as the sun sets over the loch and the herons glide in for the night. 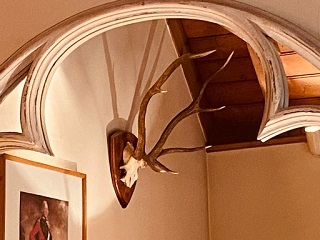 The signs and sounds are timeless and very special - birds are plentiful and wild life abounds - red squirrels and deer are frequently seen from the cottage. 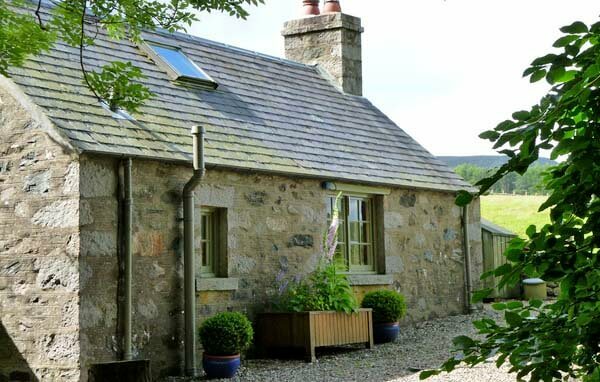 This house is the place to find peace and tranquillity for your holiday in the Scottish highlands. 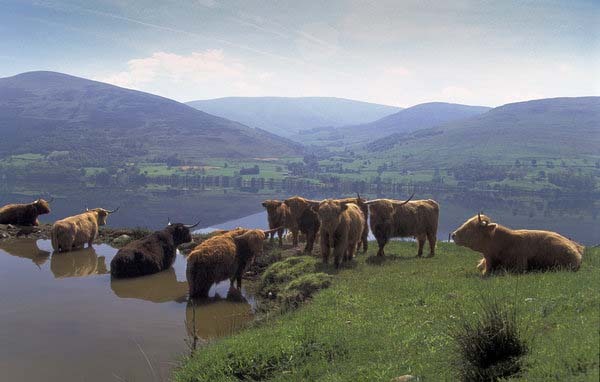 Close to the Queen's and Queen Mother's Balmoral and Glamis Castles and on the edge of the Cairngorm National Park, there is outstanding wildlife viewing, fishing, wild swimming and other sporting activities along with whisky distillery tours and artisan food producers. Championship golf courses such as St Andrews and Gleneagles (home of the 2014 Ryder Cup) are within easy reach and there are 4 golf courses within 14 miles. There are not only numerous activities and places to see both on and off the estate but because we try to do everything to make your holiday a happy one, we provide a full concierge service. We can keep secrets so if you would like us to arrange some delightful surprises for your partner, just let us know! 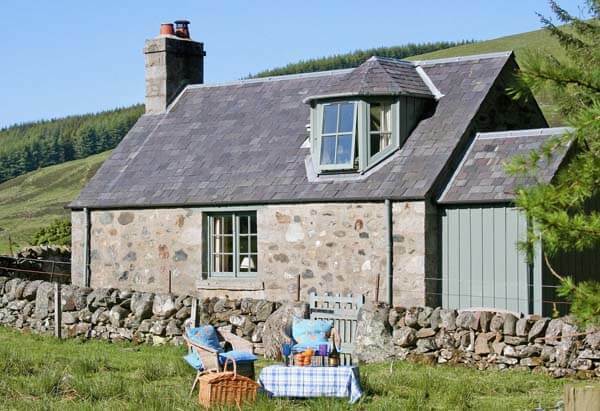 This gorgeous 18th century honeymoon cottage has a spacious beamed living/dining-room with cast-iron wood burning stove. There is a very well-equipped, modern farmhouse style kitchen and a bathroom with over-bath shower. 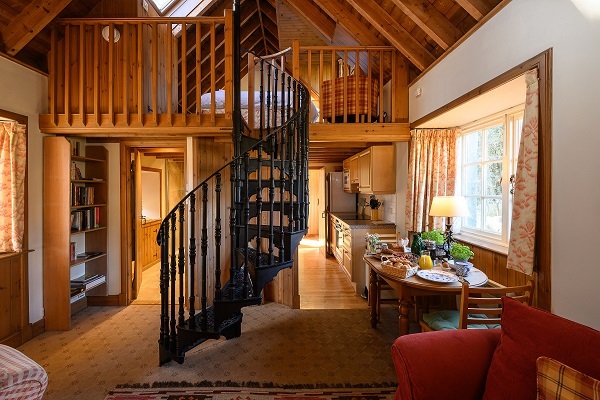 Spiral stairs lead to the first floor and a galleried double bedroom with extra long bed and beams overlooking the sitting room. Wonderful views from the bed! Utterly secluded, private hot tub in the garden, again with wonderful views. 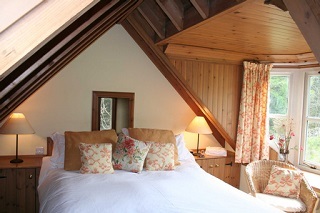 The cottage is beautifully designed and is idyllic inside and out - just perfect for a honeymoon or romantic break. Indeed many hands in marriage have been asked for here - and as far as we know everyone has accepted! All bed linen and towels. First basket of logs, thereafter available at cost. Fluffy bathrobes are provided too. To cut down on your shopping, we provide soap, cling film, foil, bin bags, loo rolls, washing up liquid, tea towels, apron, oven gloves, and essential cleaning materials and other helpful touches to start your holiday off. We can supply a cook, or romantic presents like champagne and chocolates on arrival, and a personal piper and much much more. Simply request these with your reservation - we will do everything possible to make your honeymoon or romantic break very special. Clover Cottage is rented out throughout the year. Weekly rentals are usually Saturday to Saturday; arrival 4pm and departure at 10am. Short breaks welcome. 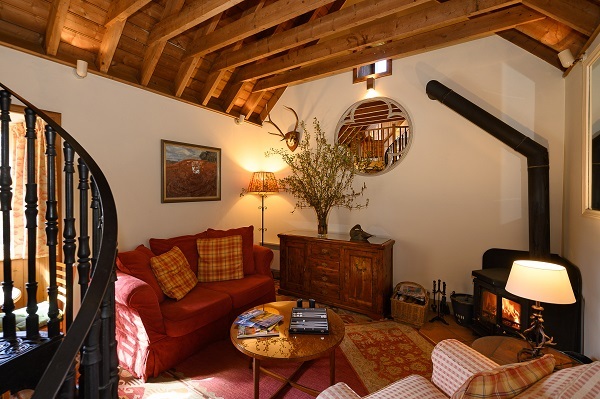 To book this lovely romantic retreat in highland Perthshire, click the enquiry button below to see availability and prices. 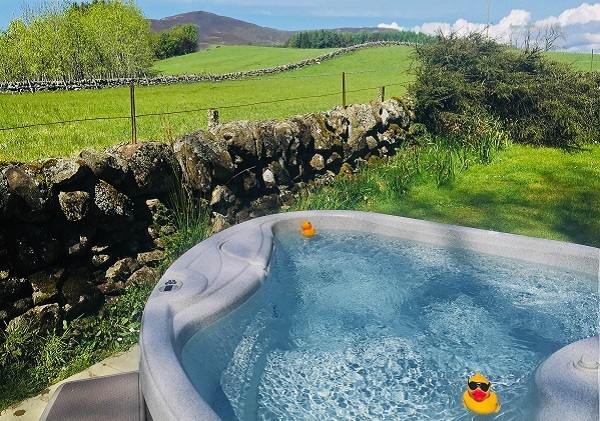 This is an idyllic honeymoon cottage set in glorious Perthshire countryside with a private hot tub. 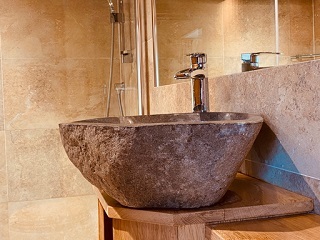 It's hard to beat for a romantic break in a top quality self-catering cottage, where the owners have thought of everything, and offer many special extras to make things even more special.